UNITED NATIONS — Secretary of State Michael Pompeo issued a warning over Iran's ballistic missile capabilities on Wednesday and blasted the 2015 nuclear agreement, ratcheting up the administration's rhetoric against the regime in remarks to the U.N. Security Council. "Today Iran has the largest ballistic missile force in the Middle East," Pompeo said. "It is clear the Iranian regime's ballistic missile activity has grown since the nuclear deal." Pompeo added: "Iran is harboring al Qaeda, supporting Taliban militants in Afghanistan, arming terrorists in Lebanon, facilitating illicit trade in Somali charcoal benefiting al-Shabaab and training and equipping Shia militias in Iraq." The top U.S. diplomat was at the council for a briefing by Undersecretary-General Rosemary DiCarlo on the secretary-general's report on compliance with the resolution that codified the 2015 nuclear deal. President Trump announced earlier this year the U.S. would withdraw from the accord, and new U.S. sanctions went into effect this fall. 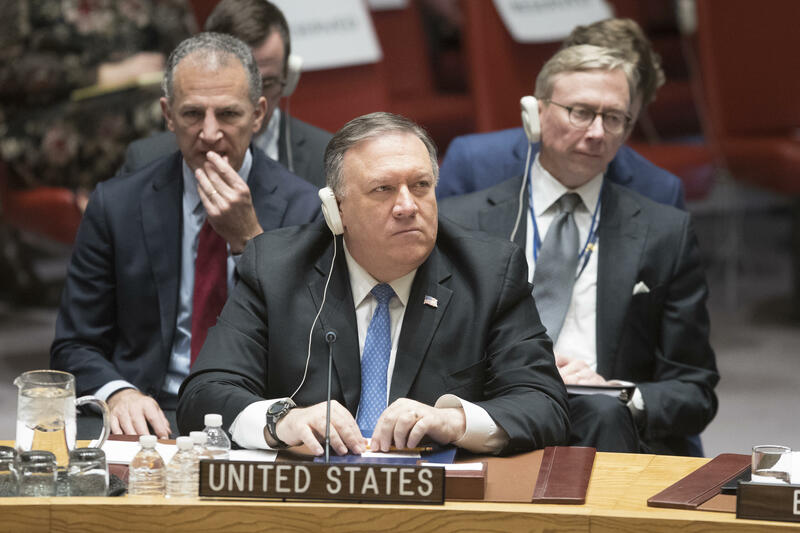 Pompeo urged council diplomats not to remove the arms embargo when it is scheduled to be lifted in 2020, to ban the launches of nuclear capable ballistic missiles by Iran and authorize the inspection of Iranian vessels, both in port and on the high seas. Reinstated U.S. sanctions against Iran have been a point of friction between the U.S. and the European Union, which intends to stay in the nuclear agreement. The EU foreign policy chief, Federica Mogherini, said this week that by early next year, a mechanism will be in place to allow EU countries to trade with Iran and avoid U.S. sanctions. Mogherini's deputy, Serge Christiane, told the Security Council on Wednesday that EU countries remain committed to advance the work to set up what's known as a "special purpose vehicle" in order "to facilitate trade payment and to provide the necessary sovereign reassurances to the market participants engaged in legitimate business with Iran." The U.N. secretary-general's report presented to the council was upbeat about the nuclear pact, based on its own investigations and those of the U.N.'s International Atomic Energy Agency (IAEA). The report said the pact "stands out as a demonstration of successful multilateralism." But despite backing the accord, both the U.N. report and the EU nations on the council expressed concern about Iran's ballistic missile proliferation. Pompeo thanked France, Germany and the U.K. "for joining the U.S. in raising concerns about the Iranian regime's reckless missile activity." Discussing the ongoing conflict in Yemen, Pompeo said that Iran has exported ballistic missile systems to the Houthi rebels: "We have hard evidence Iran is providing missiles, training." He said that Iran is "stoking conflict" in Syria as well. "This poses a threat to innocent civilians — including Americans," he said. Russian Ambassador Vassily Nebenzia said a member of the council — referring to the U.S. — is "trying to punish" Iran. Iran's deputy ambassador lashed out at the U.S., slamming what he called "American bullying policies." "Through fabrication, disinformation and invoking irrelevant criteria, the U.S. tries to create ambiguity and confusion in order to misinterpret the resolution with regard to Iran's missile launches." He said that the U.N. resolution establishing the 2015 nuclear accord does not include an "enforceable prohibition" on the missiles, citing a U.S. official. The EU statement, read out by the ambassadors from Belgium, France, Germany, Italy, Netherlands, Poland, Sweden and U.K., had stronger language than in the past: "We are very concerned about the findings of the Secretary General regarding Iran's destabilizing regional activities." The statement went on to say that ballistic missile related activities such as the launch of nuclear capable missiles "would be in violation of Security Council resolutions." "Iran has exploited the goodwill of nations and defied multiple Security Council resolutions in its quest for a robust ballistic missile force. The United States will never stand for this," Pompeo said. At the press availability, after the meeting, Pompeo said Iran has been on a "testing spree and proliferation spree and this must come to an end." "No nation that seeks peace and prosperity in the Middle East should either."